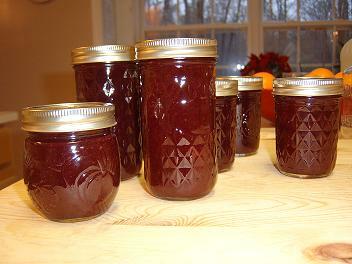 Making homemade conserve (jam or preserves) and jellies is a rewarding hobby. Thanks to a steady decline in home-canning, items like boiling water canners and pressure canners have become obsolete in many parts of the country (well, the U.S. anyway). While that is a shame, you do not have to have a canner to make jams, jellies, and preserves! Truthfully, you really only need glass canning jars, lids, rings, tongs of some sort, pectin (sometimes you don’t even need that), a wire mesh strainer, and two kettles (one with a thick bottom). 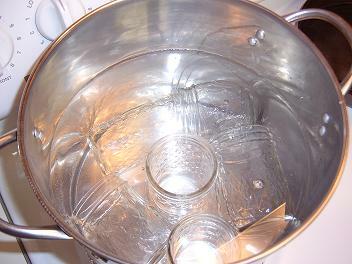 You can also create your own boiling water canner and I’ll show you how. First, let’s talk jam! 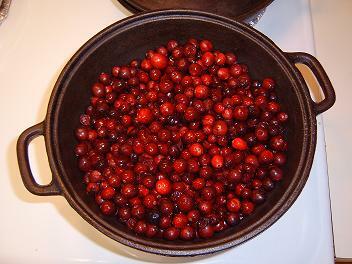 Place cranberries in a thick-bottomed kettle (I like my cast iron kettle) and pour 2 cups of water over them. Cook until nice and soft. 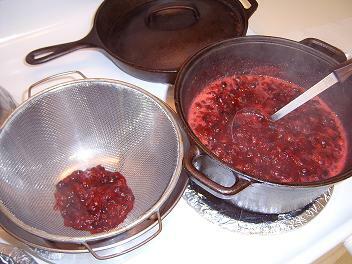 Place your wire mesh strainer into a bowl and spoon the soft cranberries into the strainers. Mash until you have 1 quart + 1 cup of puree (can add a tiny bit of apple juice or cranberry juice to make up the difference but you shouldn’t have to). 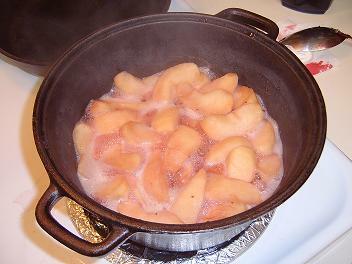 Cook the apple slices in one cup of cranberry juice until soft. 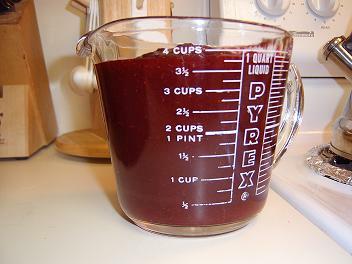 Pour into a blender and puree. 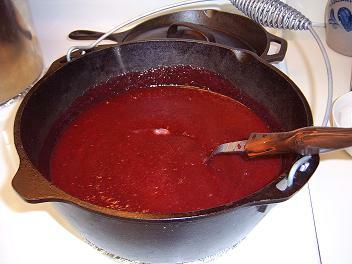 Pour into a large, thick bottom kettle with your cranberry puree. In a small bowl, mix a box of Sure-Jell Lite with 1 cup of sugar. 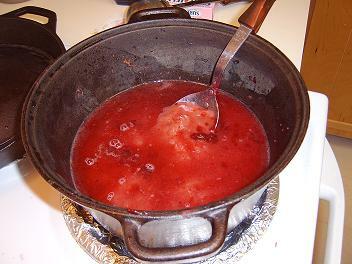 Stir into the apple-cranberry puree and bring to a boil over med-low heat. Stir constantly. When it reaches a boil, add 4 cups of sugar (STIR!). Bring back to a boil (over med-low heat). 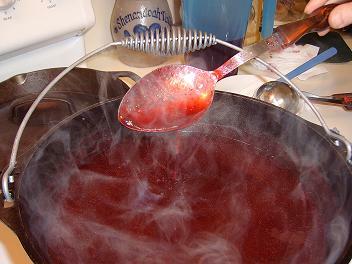 Simmer, stirring often, until mixture forms a soft ball when dripped from a spoon. Fish out a jar and lid from your boiling water with your tongs (be sure that you pour out all the water!). Now use a funnel of some type to fill each jar to the start of the glass lid ridges and place a hot lid on top. Screw a ring on tightly and then set each jar to cool on the counter. You should hear the lids popping down. Be sure you only work with one jar at a time. Allow to set up overnight and then remove your rings for later use. Need more recipes? 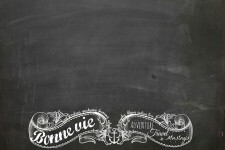 Have a TON of questions and need expert advice? Me too. When I have questions or need recipes, I turn to Freshpreserving.com and then spend the next four hours scrolling through their site trying to soak all that canning goodness in. The recipe above is an original recipe by Rev. Nancy Clark and her niece, moi. Do you like original recipes? Right on. Well, we got a site full of them. 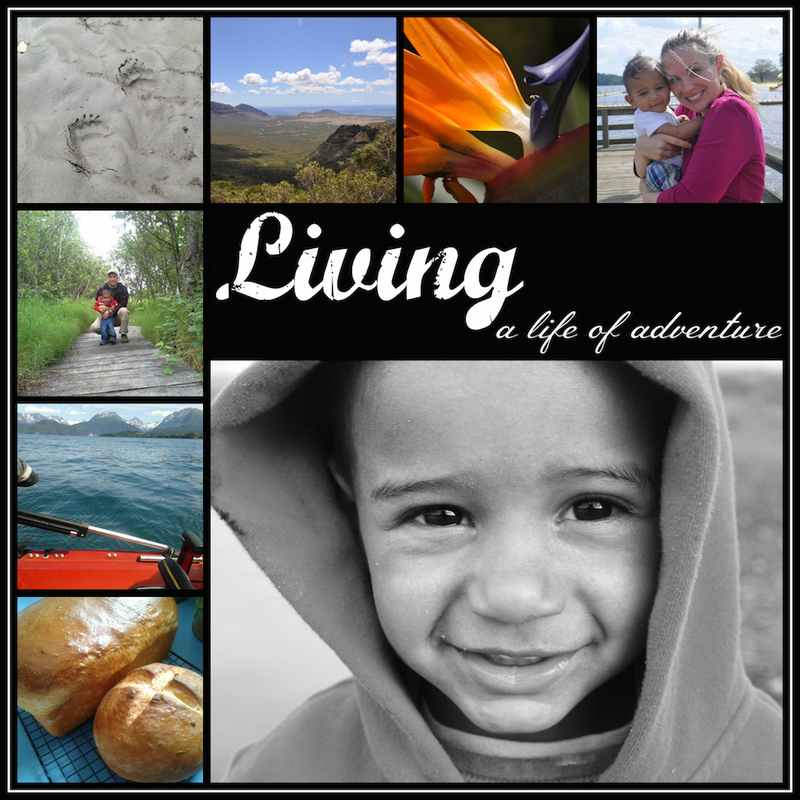 And speaking of cooking… you just gotta check out my good friend, Mrs. Darling, at Dishpan Dribble. She’s a hoot. From the moment she first appeared on my computer screen — we became full-on buds. She can cook in my kitchen any time and she doesn’t even have to wash the dishes. Doin’ super on your blog m’dear. Have an awesome weekend with your sweetie! Barb - Wonder where my comment went.. This jam is something I’m goin to try! Got the stuff today, so plan to make it this weekend. I make all kinds, but have never seen this! I can’t wait! Anything with cranberries HAS to be good! Meadowlark - I’ll give it a shot. I noticed you doing this in a cast iron pot. For some reason I thought it would remove the seasoning????? If you’re POSITIVE it doesn’t 😉 I’ll give it a try.